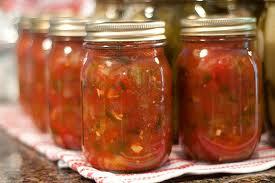 Canning salsa is easy and you get the freshest veggies to do it with out of your garden. Wear plastic gloves or rubber gloves, if you prefer not to wash your hands with soap and water before touching any part of you face. Peel, wash and dry peppers. Slit each pepper on its side to allow steam to escape. Peel peppers using one of the following ways. Place chilies in the oven at 400 degrees or broiler for 6-8 minutes until skins are blistered. You can also roast the chilies on a cast iron griddle or pan once roasted remove to plate and cover with a damp towel. This will make them easier to peel. Wash tomatoes and dip in boiling water for 30 to 60 seconds or until skin splits. Dip in cold water and slip skin off and remove core. Coarsely chop and combine peppers, onions and remaining ingredients in a large saucepan. Heat to boiling and simmer 10 minutes. Fill jars, leaving ½ inch at top Adjust lids and process in a boiling-water bath for 15 minutes. It’s always best to use pints or smaller jars if you don’t use a lot of hot sauce, once you open the jar keep refrigerated until used. Wonder Ovens can Save You Fuel after TEOTWAWKI. This entry was posted in cooking, recipes and tagged canning salsa, Preparedness Mom, salsa. Bookmark the permalink.